Accepta 2905 is a high performance antifoam and foam control agent available in a concentrated form scientifically formulated for use in potato processing, vegetable washing, sugar beet processing, and paper and paperboard production where foaming is an inherent problem. Our high performance potato and vegetable washing antifoam is scientifically formulated to eliminate foam produced during the washing, conveying and preparation of vegetables over a wide range of temperatures. Accepta 2905 is particularly effective in the washing, conveying and slicing of potatoes related to crisp manufacturing. Accepta 2905 foam control agent has been specially designed for use in a number of direct and indirect food processing applications including potato and vegetable processing, sugar manufacture, paper and paperboard production, plastics and adhesives. Accepta 2905 is formulated to comply with current UK (MAFF) regulations as well as one or more of FDA CFR 21 No’s: 173.340, 175.105, 175.300, 176.170, 176.180, 176.200, 177.2260; BGA Chapters 14 and 36 and the French “Repression des Fraudes”. This product is approved Kosher Parev by the Manchester Beth Din. Accepta 2905 is used as supplied. Application of Accepta 2905 to the foaming system is best achieved through a suitable metering pump. The dosage rate for Accepta 2905 is dependent by practice but is typically 1-10 mls per minute. 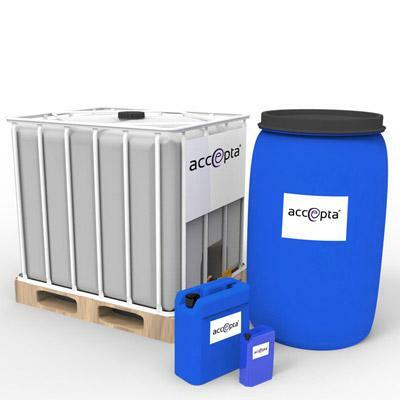 Accepta 2905 may alternatively be dosed to new tank water initially at 1-3 kilos per 5000 litres and then 0.5 kilos every two to four hours.